The second generation Google Nexus 7 is faster, slimmer and all-round better than 2012’s model — but no longer has an embedded secure element. 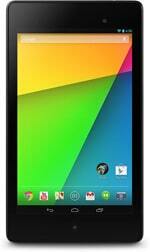 The Nexus 7 is made by Asus and boasts a quad-core Qualcomm Snapdragon S4 Pro processor and 2GB of RAM. The tablet also offers dual-band Wi-Fi and optional 4G LTE. The device’s screen resolution has been uprated to 1920 by 1200 pixels, while Fraunhofer surround sound, Bluetooth 4.0 and Qi wireless charging are also built in, along with NFC. 2013’s Nexus 7 has, however, dispensed with the embedded secure element that Google has included in its NFC devices up until now. This means that, unlike last year’s model, the tablet does not support Google Wallet’s NFC payment capabilities.